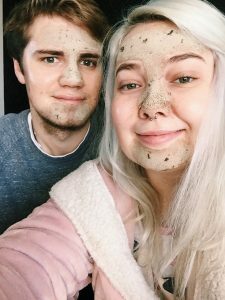 As multi-masking is everywhere right now and The Body Shop are one of my absolute favourite brands for skincare, I thought it’d be fun to show you mine and Jakes experiences with their Superfood mask range as I have some samples of each of them to use up. 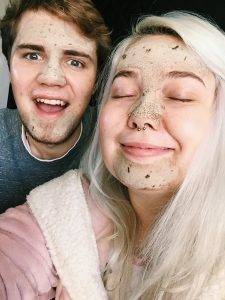 We decided to try out two masks at a time as otherwise it’d be a horrendously long post. It’s still ended up pretty long but nonetheless, hope you enjoy! Now I’m a regular user and a big fan of the Himalayan mask anyway, it’s vegan and is a charcoal based mask which is fabulous for balancing the oils in the skin, it also contains ground up green tea leaves which will help with detoxing and act as an exfoliant aswell as tea tree oil to soak up any excess and un-needed oil the skin produces. We are using this on our T-zone and chin as these are our worst problem areas. The honey mask is vegetarian and is a very thick and gloopy consistency so you really don’t need a lot of it at all. 20% of it is actually purely honey and it also contains marula oil and olive oil which are the perfect partners for softening and nourishing the skin. I absolutely love the smell of this mask and due to the concentration of honey in it, its antiseptic properties are brilliant so it’s fab for lifting the bacteria out of spots. We are using this on our cheeks and any areas not covered by the Himalayan mask as these tend to be the dryer areas of the face. Me: I feel like the Himalayan made my skin super glowy and smooth and reduced the size and redness of my blemishes. It feels comfortable on the skin on application and the green tea leaves are the perfect addition so you don’t have to use a scrub aswell. I love the smell and texture of the honey mask but I don’t feel like it did much for my skin personally. The ginseng mask is a good alternative to the himalayan one to use if you suffer from flakier and more sensitive skin as due to the pretty strong ingredients in the himalayan, it can tend to be quite stringent. It’s vegetarian, a super creamy consistency, an exfoliant mask and the particles are rice powder. The ginseng in it will help to tone and brighten the skin and it also contains sesame seed oil which is a big skin softener. The British Rose mask is quite like a thinner jam-like gel consistency and it kind of looks like it too, it has a subtle rose smell exactly the same as the British Rose bodycare range and is infused with rosehip oil, real rose petals and cooling aloe vera. This one is said to re-plump and put the dewiness back into the skin. Me: I really dislike the smell of the chinese one for some reason and it puts me off quite a lot, I love the cooling and calming effect of the rose though. My skin felt really deeply cleansed from the chinese mask and slightly tightened but in a good way. It definitely calmed down the redness of a spot I had showing its head and my skin felt a lot softer. Jake: The chinese mask smells like refreshers, it’s cooling, less burny than the himalayan one (he then confirmed he meant the himalayan mask, not the himalayan people…?). He said the rose one is very nice and cooling, smells like how he’d imagine rose jam to smell, apparently the consistency is “mid-thicc like me” HA. He also thinks it looks like we’re wearing halloween makeup. Cheeks felt moisturised and slightly plumper and forehead felt smooth but not as effective as the himalayan. The Japanese Matcha mask is the newest to the superfood mask clan only being added a few months ago, it contains matcha green tea, aloe vera and is designed to purify, exfoliate and save the skin from impurities and pollutants. It is also 100% vegan and claims to add radiance to the skin making it look younger. To me, the Amazonian Acai mask smells JUST like Pimms, it really reminds me of summer berries it smells so gorgeous. This concoction is said to smooth the skin, fight the appearance of fatigue and give the skin a fast recharge (don’t we all need that?). It’s also infused with acai berries and babassu oil and is also part of the vegan crew. Me:The matcha mask smells super fresh and cucumber-like, it is also really cooling and would be perfect to use on a hot day in summer. The acai mask texture was really nice but did tingle slightly on my cheeks. After using, I felt like the matcha mask made my skin look and feel really soft, supple and cleansed but the acai berry made my cheeks slightly red so I think I may have had a slight reaction to it! 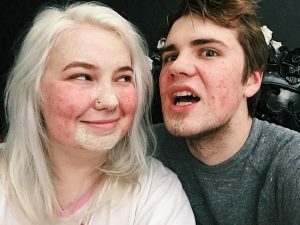 Jake: He felt that the matcha mask was tingly after a few minutes and smelt exactly like cucumber, the acai mask was satisfying to apply as the consistency was as thick as jam and it smells like turkish delight! 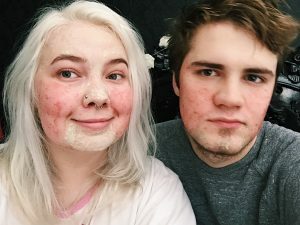 He didn’t really feel like either of these masks did anything for his skin unfortunately. Out of them all, both of our favourites were the Himalayan Charcoal Purifying Glow Mask as it was the most effective all-rounder but I’ve found a new love in the Chinese Ginseng and Rice Clarifying Polishing Mask despite the smell not being my favourite. Have you tried any of these superfood masks? What is your go to mask when your skin is failing you? NYX Vivid Brights Coloured Liners! This post is so cute! I’m working on something very similar with my sister haha (not Bodyshop though). I absolutely LOVE Pimms and the smell of it so now I really want to try the Acai one! I’m a massive lover of the Bodyshop but I’ve never actually tried a facemask from there – might give them a go now! Love this! I’ve heard soo many good things with these Superfood Masks but I’ve yet to try them. With my sensitive and blemished skin, I just don’t know which one would work best. Maybe I need to chat with them instore? I know they are always really friendly with things. Something like the Himalayan mask sounds good with its antiseptic properties. Thank-youu girl! I absolutely ADORE the Honey Mask when my skin is dehydrated! I can’t wait to try some more of these out. 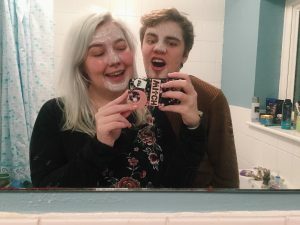 Also, I’m gonna have to recreate this post with my other half since he’s always using my face masks now & has way too many opinions on my weird beauty products haha! I really love The Body Shop! Havent tried their masks though and after reading this post I really need to! All of these masks sound like the ingredients are refreshing! 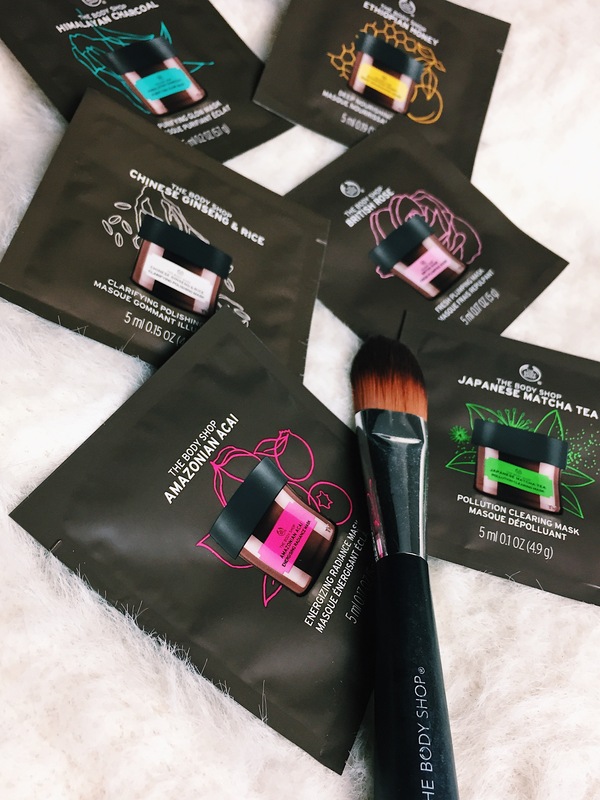 I haven’t tried these but I need to take a look because I love masks! Guys you both exude confidence and goodvibes. Loved this one the product reviews the pics. I like so many vegan /vegetarian prods out there! ? P.S. I nominated you for the bloggers award. I love all your content and consistency in posts ? P.S. I nominated you for the bloggers award. I love all your content and consistency in posts . 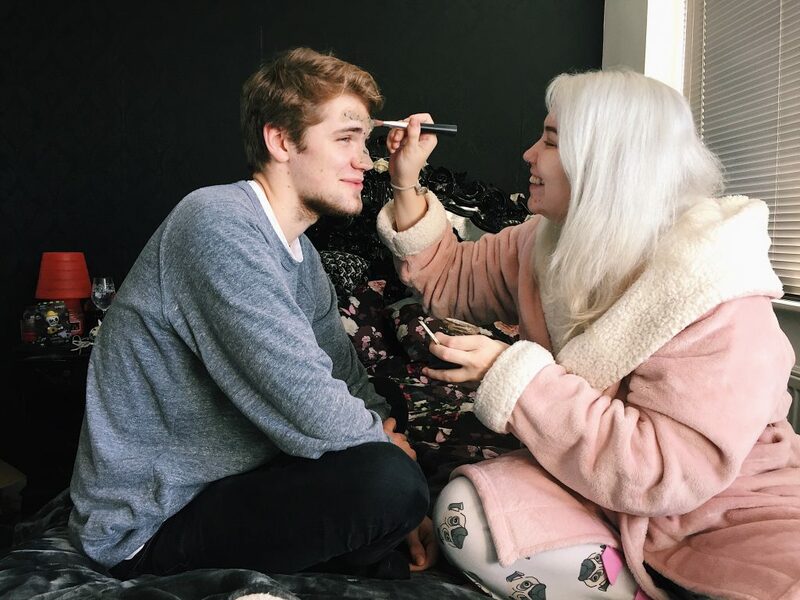 You already know that I think you and your boyfriend are absolute couple goals, but this is the cutest thing in the entire world! ? I’ve wanted to try the Himalayan Charcoal Purifying Glow Mask for just about forever, and I’m hoping that during the lead up to Christmas, they’ll do a 40% student discount offer again, because I think it’s finally time to pick it up.. ? The Body Shop are soooo popular for their face masks, I have the amazonian acai one, but I haven’t actually used it yet. I should probably use it. I also really love your pictures, they are so funny and cute. 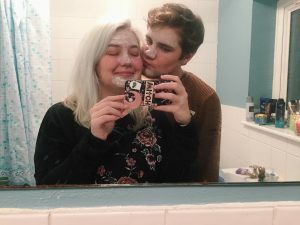 I ALWAYS put face masks on my boyfriend lol! Great post! My friend really rates these and I was tempted to try but didn’t want to buy the big pot! I didn’t know they did these sample sizes, will have to get some! Awww all of those photos are the cutest! I’ve a couple of these masks sitting in my beauty room that I haven’t tried so I must give them a go! I’m a bit disappointed the honey mask didn’t do much for you as that one really intrigued me! super cute that you guys both gave your opinions! it’s so lovely that he was willing to give his input! i love the body shop masks! i haven’t been able to try them all but the ones i have tried were fabulous! sending lots of love! He secretly loves the pampering ? you should ask for some samples in store, they’re usually happy to give you some! ?